Lecture: "U.S.-China Economic Relations: Grand Decoupling or a Grand New Bargain?" 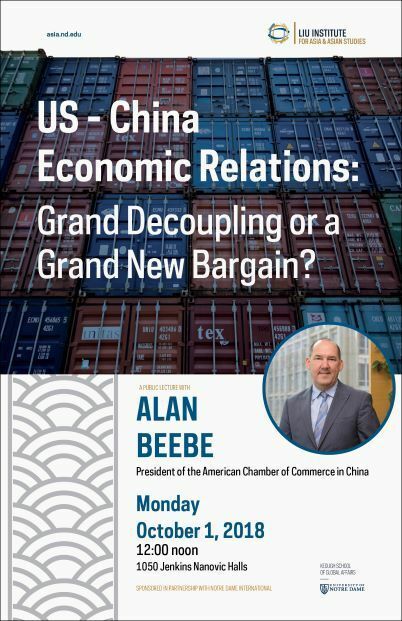 Alan Beebe is president of the American Chamber of Commerce in China based in Beijing. He has more than twenty-five years of industry and management consulting experience in Asia, including over fifteen years in mainland China. As president, Alan oversees all advocacy, programs, partnerships and insights provided by the Chamber to support the business growth of nearly 900 foreign corporations operating in China, including most of the U.S. Fortune 500. Over the past year, he has led major advocacy initiatives related to trade tariffs, market access, cybersecurity, Made in China 2025, China’s NGO law and structural imbalances in the U.S. – China trade and investment. In 2018, he designed and launched AmCham China’s Technology & Innovation Initiative, focused on the business and policy implications of disruptive digital technologies such as artificial intelligence, blockchain and cloud computing. Prior to joining AmCham China, Alan held various senior executive positions in China with EY, IBM, and management consulting firms AT Kearney and PRTM. He also led a Beijing based start-up for five years, the China Greentech Initiative, which merged in 2014 with the Paulson Institute, founded by Hank Paulson.